Sushi is no longer a new and arcane food to westerners but in many ways it still retains its mystery. 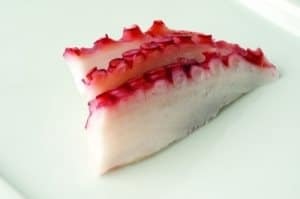 Not just in the sense of the overall experience, but many of the available sushi items are still something that westerners may never have encountered, or still not know much about. Sushi items that are not uncommon can also be served in a myriad of unfamiliar ways and there are new types of fish and other foods that are appearing on menus every day. As sushi continues to become more popular outside Japan, offerings become more diverse and new food items heretofore unavailable are being seen in even in the less traditional sushi restaurants. 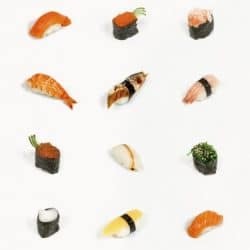 We have created a new section to highlight the various sushi food items available (with pictures), from the common to the obscure, and everything that goes along with it. For those of you who may wish to know a little more about what you are eating, this is the section for you. We have just begun this daunting venture and will continue to expand this section with new items, and are certainly open to suggestions for new sushi items to profile, so feel free to contact us if you would like to know more about a particular item that you do not see in this section. Have fun reading this section and meshi agare! The highest quality Akagai, or surf clam, is sourced from the pristine and untarnished Northern Atlantic Ocean. Learn about this ingredient here! 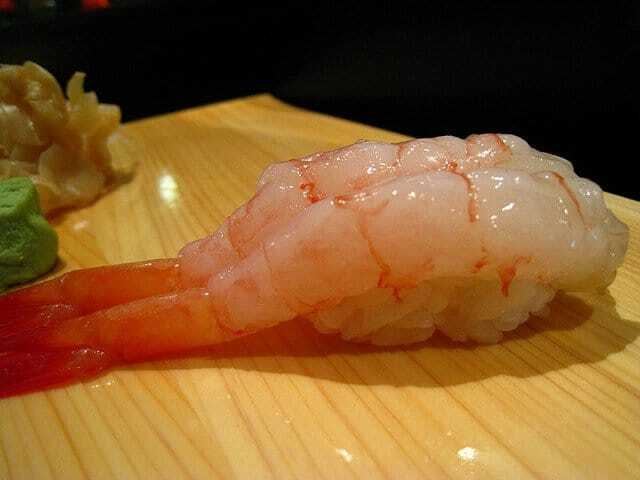 Amaebi, or sweet shrimp, are the only shrimp best served raw. 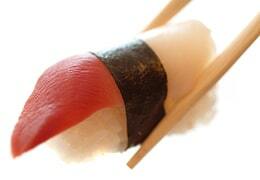 Read all about this succulent and sweet sushi item here! While abalone are used in jewelry worldwide because of their bright, colorful shells, it is the flesh inside which is prized for awabi sushi. 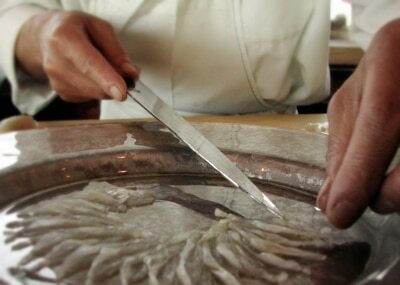 Fugu is a delicacy which only licensed chefs are allowed to prepare in Japan. 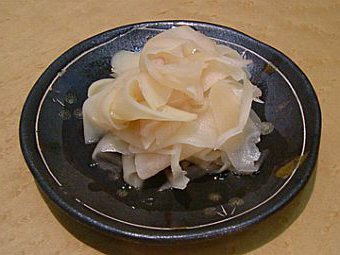 Gari (pickled ginger) is a fragrant and somewhat spicy condiment used often in sushi. Find out it's incredible properties and why it is so often served with your meal. 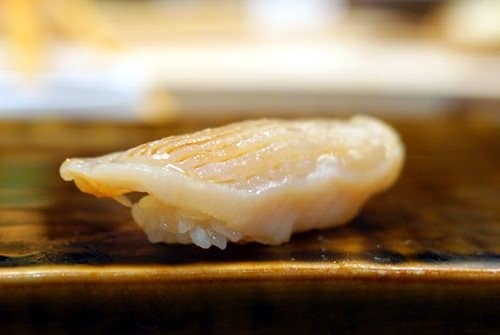 Hirame (hee-rah-meh) is the Japanese term for Fluke, which is another word in the US for Summer flounder. KaniKama (also known as Surimi) imitates more expensive crab in texture and taste. 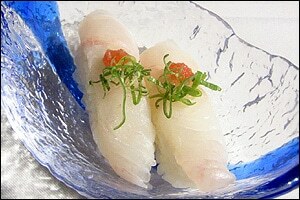 Read about this interesting sushi item and how it is made and used. 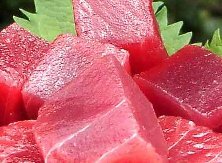 Maguro (mah-goo-roh) is the Japanese term for bluefin tuna, perhaps the best known and most commonly eaten fish in all of sushi dining. 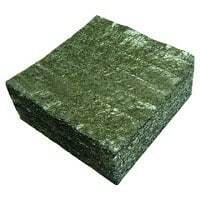 Nori is the familiar dried seaweed most commonly used to wrap sushi rolls and is both nutritious as well as useful for making sushi. Read about this interesting sushi item here! 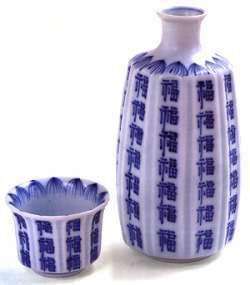 Sake(sah-keh) is a fermented alcoholic beverage with a long history in Japanese culture. 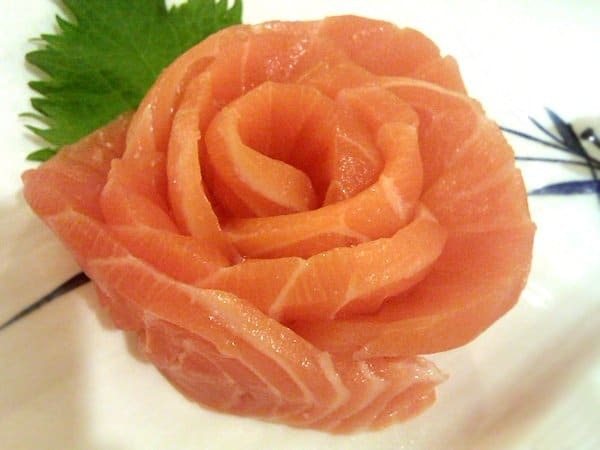 Sake (sah-ki), or salmon, is a relatively new sushi ingredient which is used in a wide variety of rolls. Read on about this healthy and delicious fish! 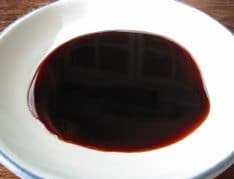 Shoyu, as Japanese soy sauce is called, is a dark brown sauce created by the fermentation of soy beans. 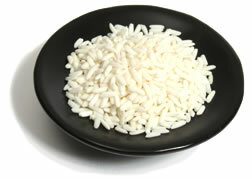 Sushi Rice (sushi meshi), as Japanese rice is commonly called, is best known by the stickiness of its grains. Easily identifiable, Tako (Octopus) is a delicious and chewy choice for those brave enough to give it a try. 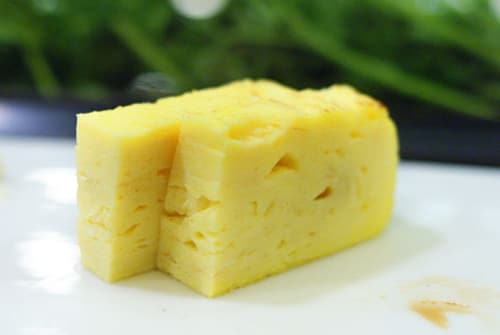 Tamago (tah-mah-goh) is an incredibly Japanese egg omelet that is not just tasty, but a testament to a sushi chef's skills. 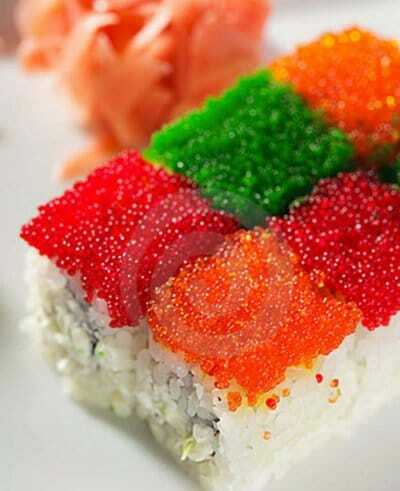 Tobiko and Masago are the eggs (roe, or caviar) of the flying fish and the capelin. Unagi and Anago are high in Omega 3 fatty acids, tasty, and deeply rooted in Japanese culture. 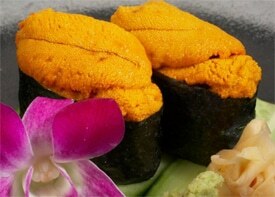 Uni (oo-nee) is the Japanese name for the edible part of the Sea Urchin. 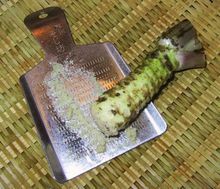 Wasabi (wah-sah-bee), often incorrectly called Japanese horseradish, is among the most misunderstood yet integral aspect of the sushi experience.